The Minx and I were recently asked to a media dinner at The Rusty Scupper to try out some of their new menu items. The restaurant's amazing view of the Inner Harbor is reason enough to pay them a visit, but General Manager Edward Prutzer and Executive Chef Mark Miranda have challenged themselves to come up with new and interesting dishes that will give diners a reason to keep coming back. We started off our meal with salads: I chose the chopped salad while the Minx tried the spinach salad. 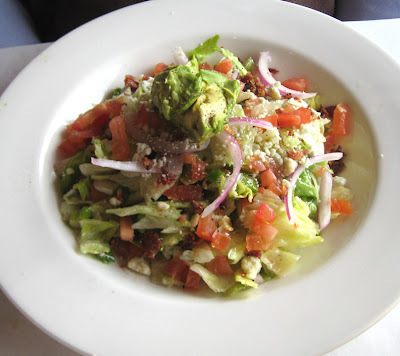 The iceberg lettuce in my salad kept all the elements cool and refreshing and the herb parmesan dressing was appropriately light so as not to overwhelm the bright flavors. With summer coming, I can see this as a popular item. I could've gone for a little more applewood smoked bacon but, then again, who couldn't? 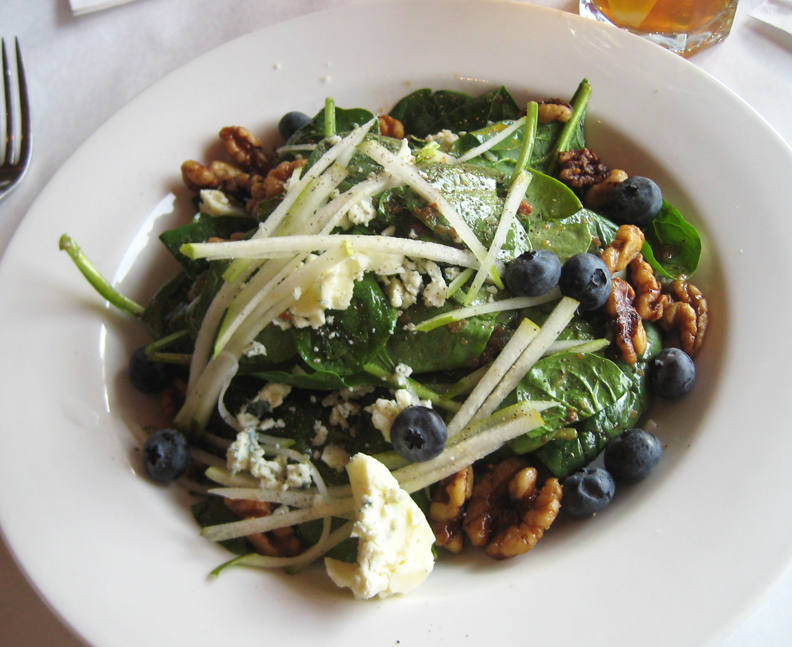 The spinach salad was more complex with a nice balance between the sweet (pear, candied walnuts and blueberries) and the savory (gorgonzola and roasted onion vinaigrette). The Minx especially liked the generous portion - this is no wimpy salad. 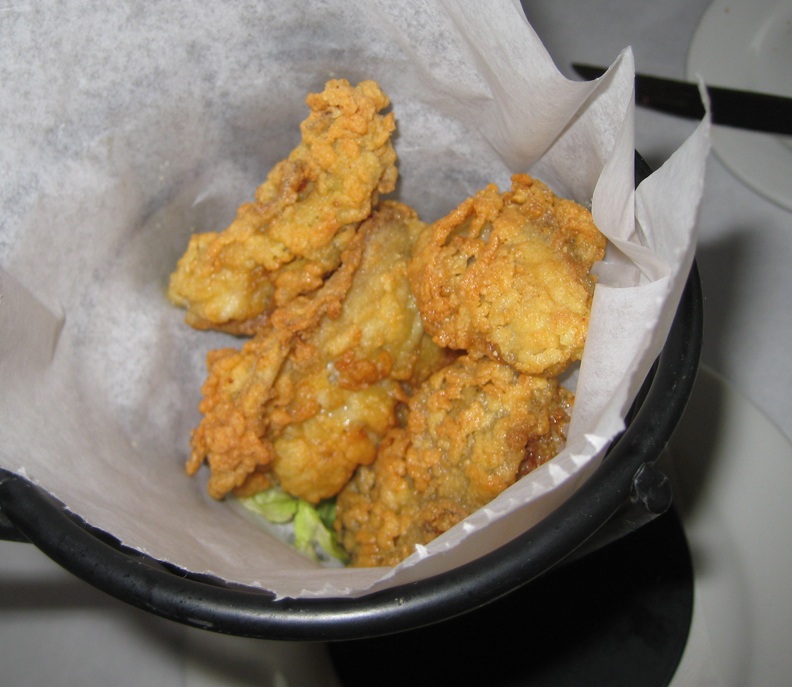 Next we shared an appetizer portion of fried oysters. A fairly simple dish, the oysters were nonetheless fried perfectly in a delicate batter that did not seem oily or heavy. The oysters within the GBD (golden brown and delicious, of course!) coating were moist and succulent. So far, we were feeling quite pleased with the meal and we hadn't reached the entrées yet. As a sucker for anything made with pasta, I couldn't pass up the Cajun crab linguini. 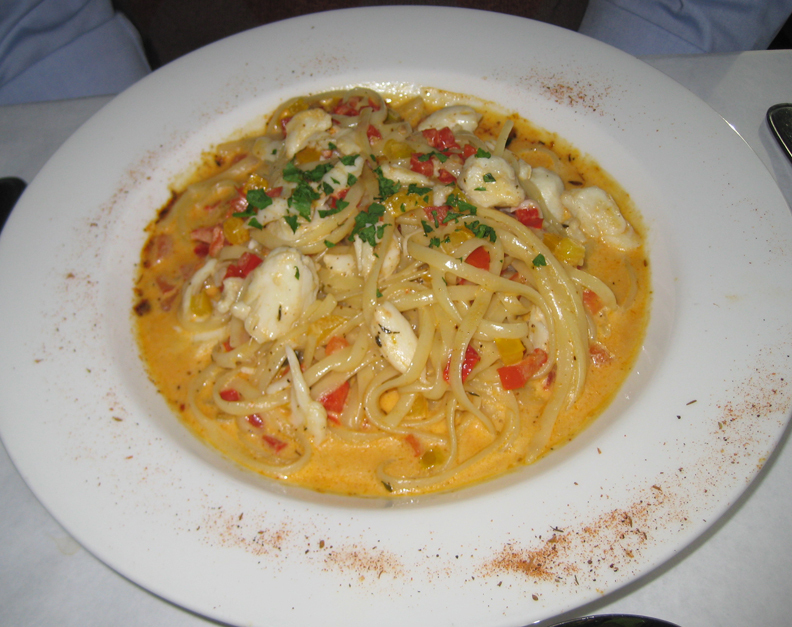 The cream sauce was decadently rich, perfectly complimenting the silky linguini, and the ample lumps of crab meat provided the taste of the sea. What I was missing was the bold spiciness I associate with Cajun food, but I'm sure the chef must tailor his seasoning to a broad audience and my tolerance for heat is probably higher than many. Every time we've had cedar planked salmon in the past, we're always disappointed to find that none of the smoky cedar flavor has been imparted to the salmon. This is not the case with The Rusty Scupper's version, however. The salmon was heavily infused with rich cedar smoke flavor. It was also moist and juicy, with a crisp edge, perfectly cooked. We learned later that Chef Miranda has developed a special smoking technique that allows the fish to absorb the smokiness. I think this dish was the revelation of the whole meal. As you can imagine, we were well and truly stuffed, but we couldn't walk away without dessert. 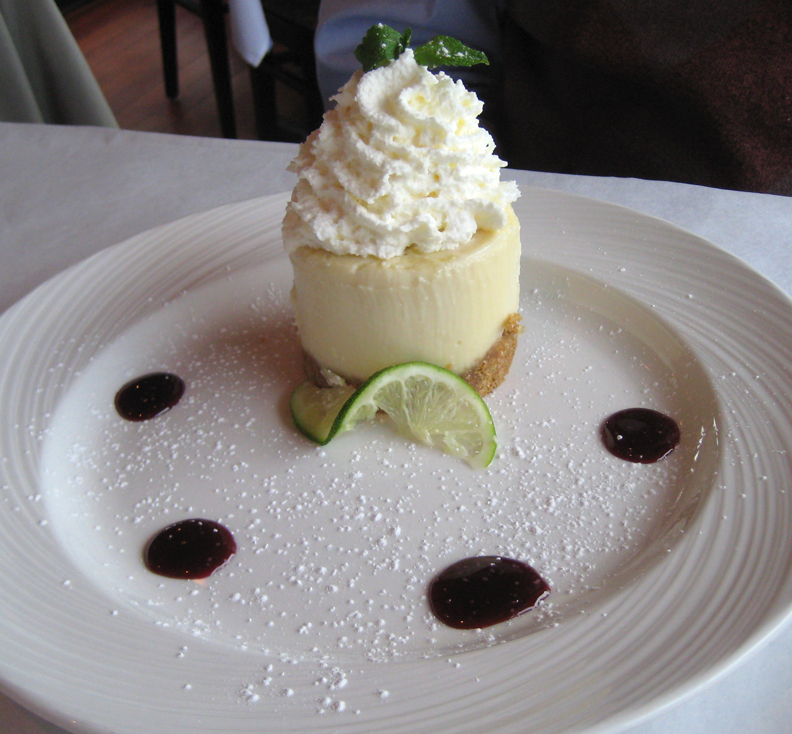 I ordered the key lime tart while the Minx went for the Fuji apple bread pudding. The word "tart" is a bit of a misnomer; it's really more like a mini-cheesecake. The richness of the cheesecake filling, perched atop a thick graham cracker wheel, is toned down by the bright citrus of the key lime. Swirling your bites through the refreshing raspberry coulis also lightens this rich dessert. 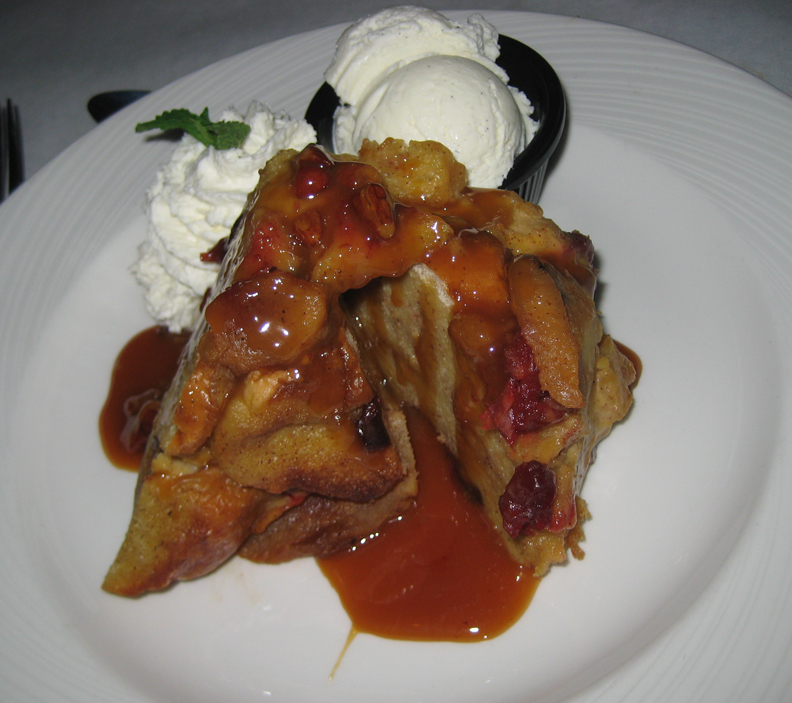 The bread pudding was an enormous pile of gooey goodness, drowning in pecan praline sauce. The side of vanilla ice cream was almost overkill, but it did provide a creamy counterpoint to the pudding. So filling and satisfying was the meal, we ended up taking most of our dessert home in a doggy bag. With so many new restaurants opening in the area every year, it's easy to overlook some of the landmark places in favor of the next big thing. 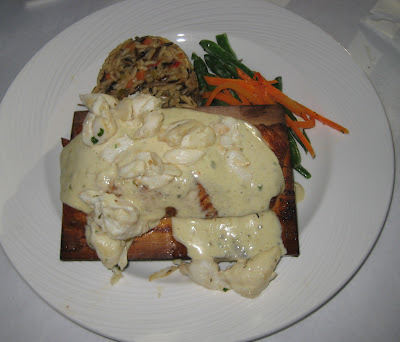 With their focus on updating their menu on a regular basis, you can almost see The Rusty Scupper as an ever new restaurant located in the same exquisite location.